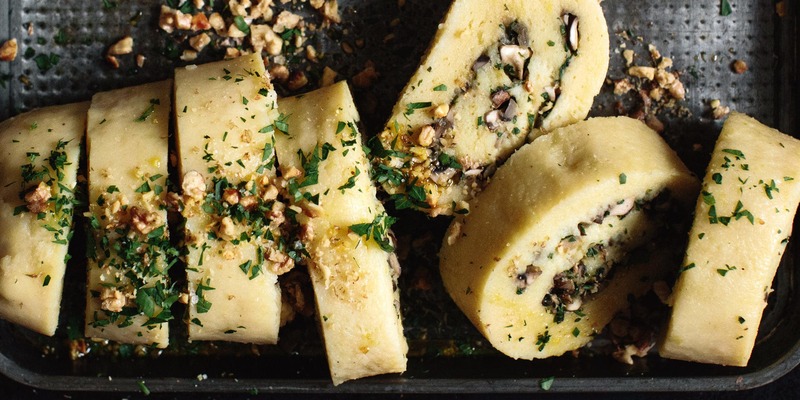 We created the recipe for this potato roll for a vegan Christmas dinner. It was served with filled savoy and gravy. You can read the whole article about the Christmas dinner in Rensow here. For the dough cook the potatoes with their skin for about 20 minutes until they are ready. Drain them and let the steam off before skinning them. While still hot, put them through a potato ricer and mix them with salt, semolina, flour and some nutmeg until you have a smooth dough. For the filling finely chop the shallot and dice the mushrooms. Heat some rapeseed oil and sweat the shallots in it. Add the mushrooms and fry them until they crumble. Wash the parsley, pick he leaves and finely chop them. Add it to the mushrooms and season the filling with salt. Drain spare water from the mushrooms, it can be used for sauce base. Roll out the potato dough on a bit flour to a square of about 30x30cm.Spread the mushrooms on the dough, but leave a border on the top side to close to roll better. Now roll the potato dough from the bottom up to the top. With the last turn bring the potato roll on a moist kitchen towel. Furl the roll tightly into the towel and tie the ends with baker’s twine. Boil saltwater in a big elongated pan or baking dish and cook the potato roll covered with water for 45 minutes. Putting the roll into a greased form and into the oven is not only convenient to keep it warm, but grilling it also gives it a golden yellow color. We like to serve the potato roll with roasted wall nuts and some chopped parsley. Liebe Mareike, wir würden die Rolle schon fertig kochen und dann lieber noch einmal aufwärmen. So, wie auch im Rezept beschrieben: “Nicht nur zum Warmhalten ist es praktisch die Kartoffelrolle, ohne Tuch, in einer gefetteten Form einige Minuten in den Backofen zu stellen. Unter dem Grill kann man die Rolle auch backen, bis sie eine goldgelbe Farbe bekommt.” Viel Spaß beim Nachkochen!